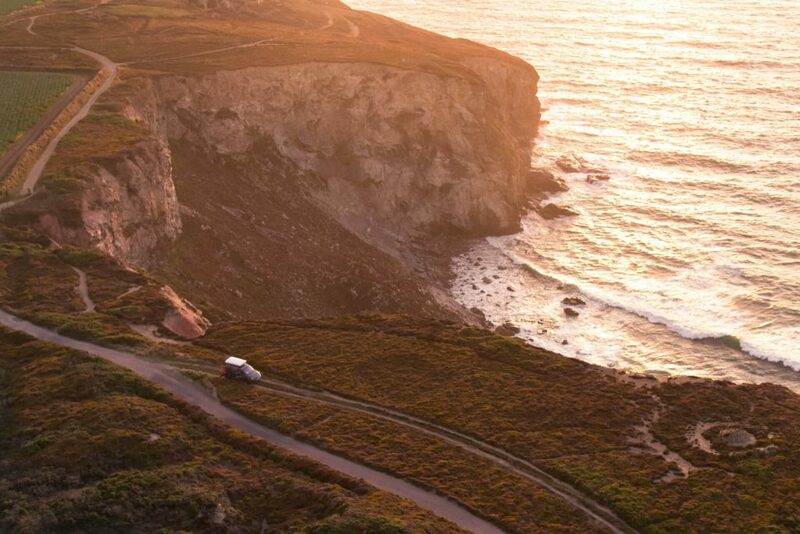 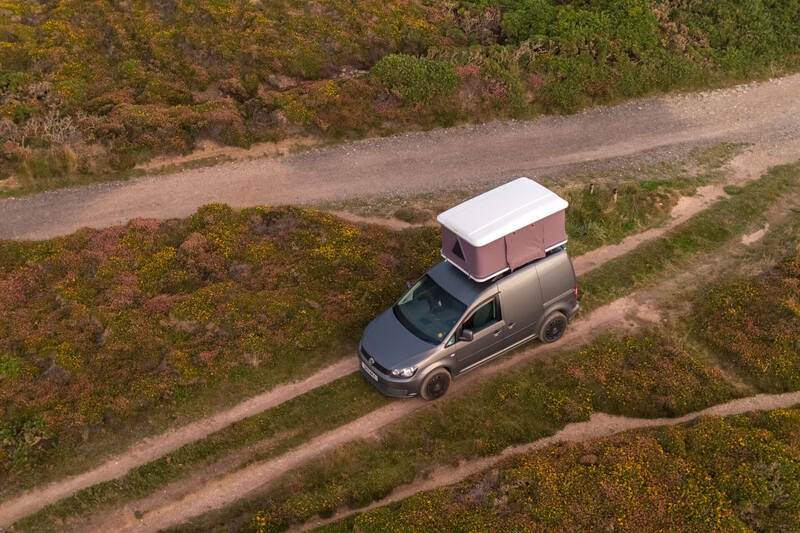 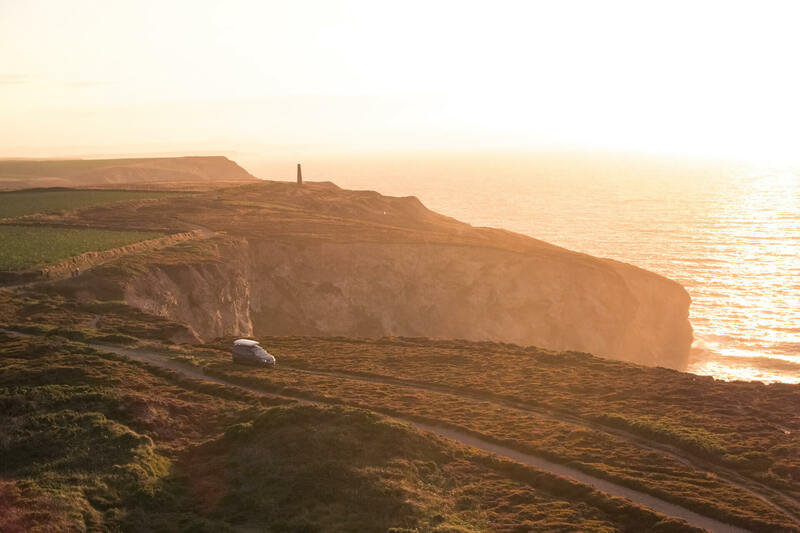 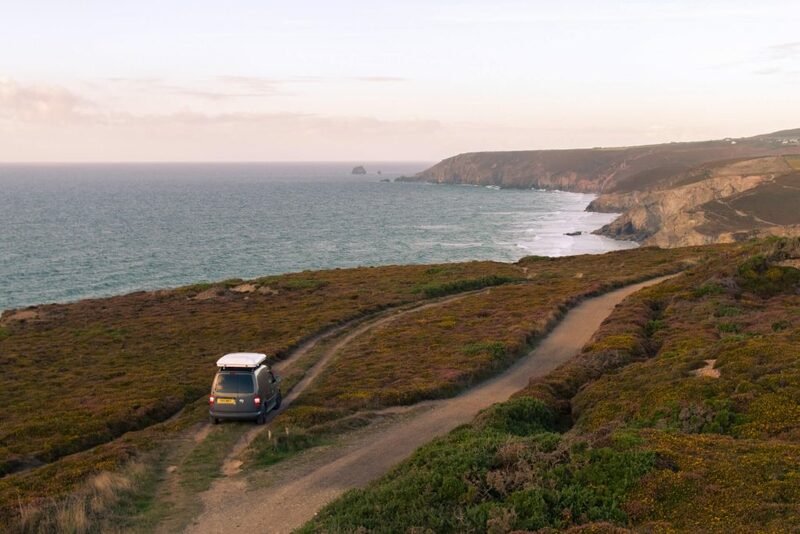 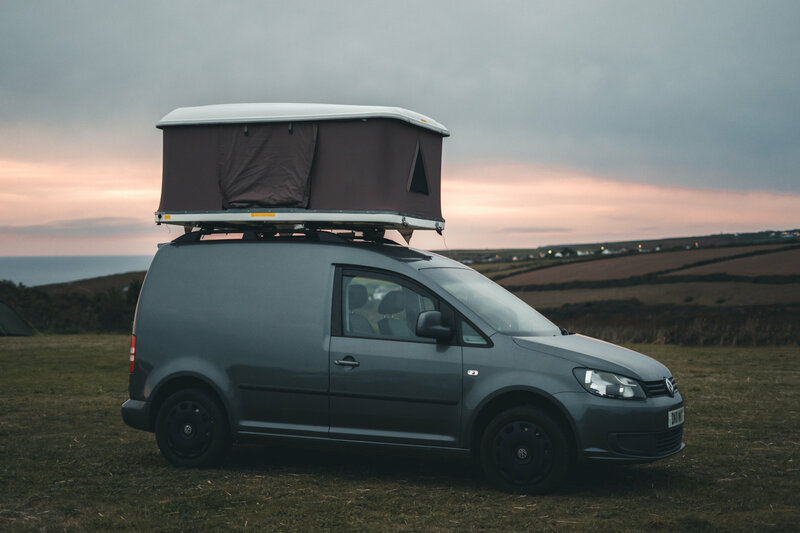 Take your vacation off the beaten path and get away from it all in our cosy 2 and 3 person hard shell expedition roof top tents. 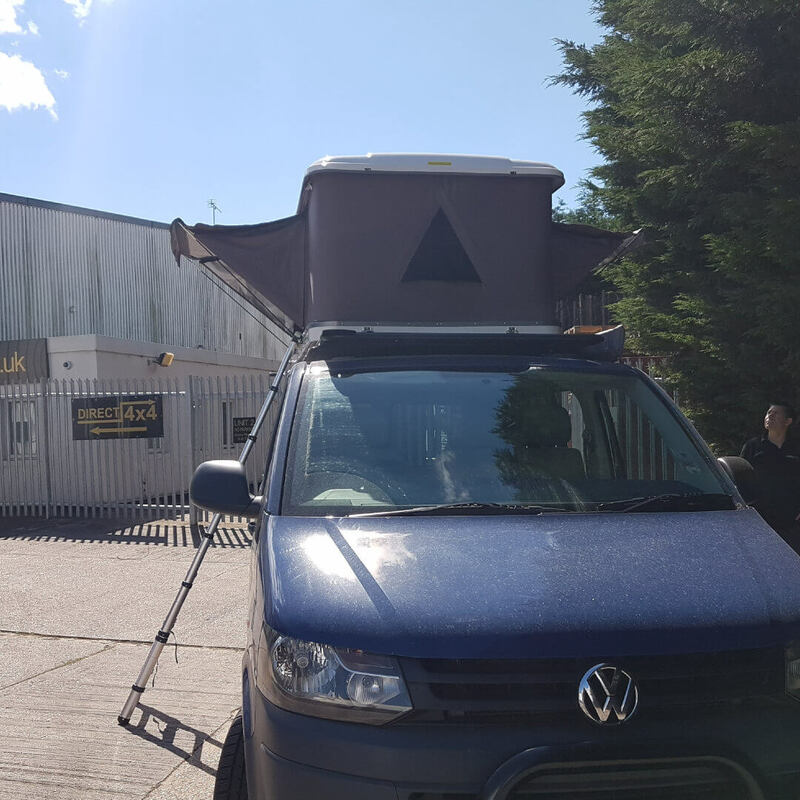 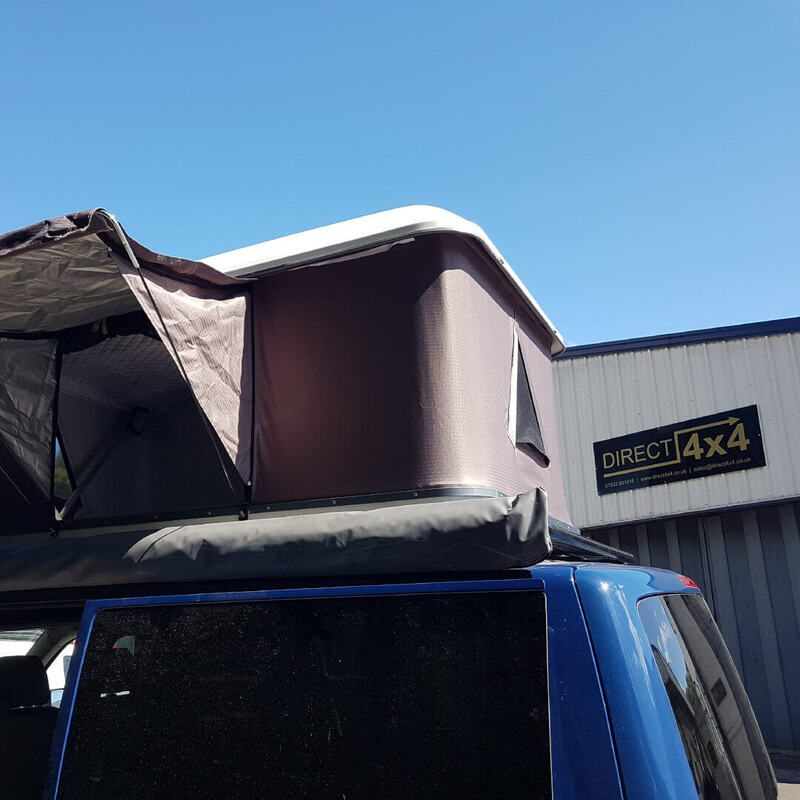 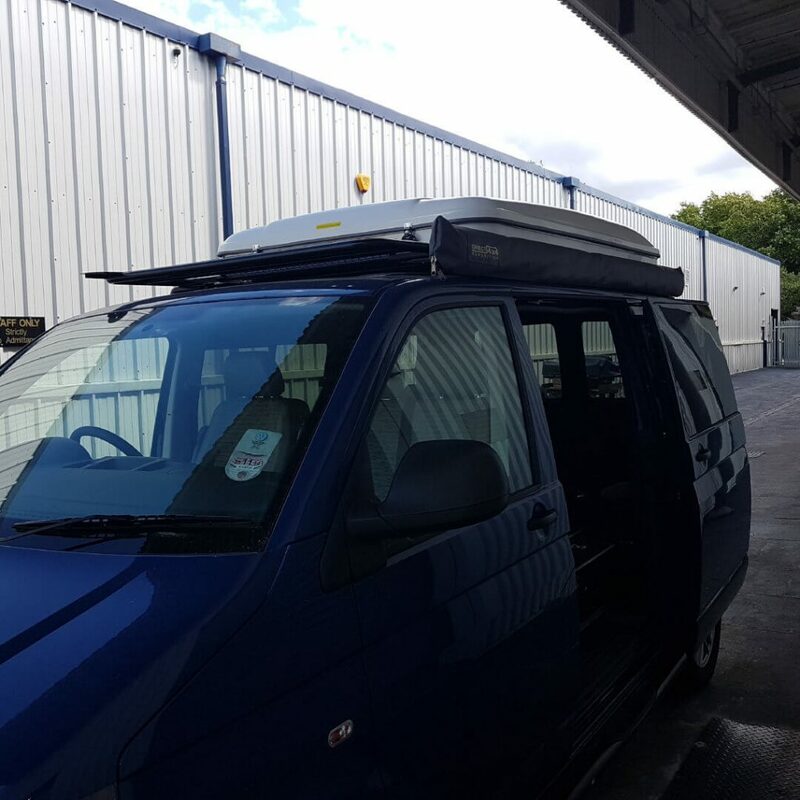 And the best bit is that this expedition roof top tent from Direct4x4 will fit many different vehicles of varying heights thanks to its universal roof bar/roof rack fitting brackets and a strong aluminium telescopic ladder. Roof top tent + ULTI Bar roof bar bundles also available here. 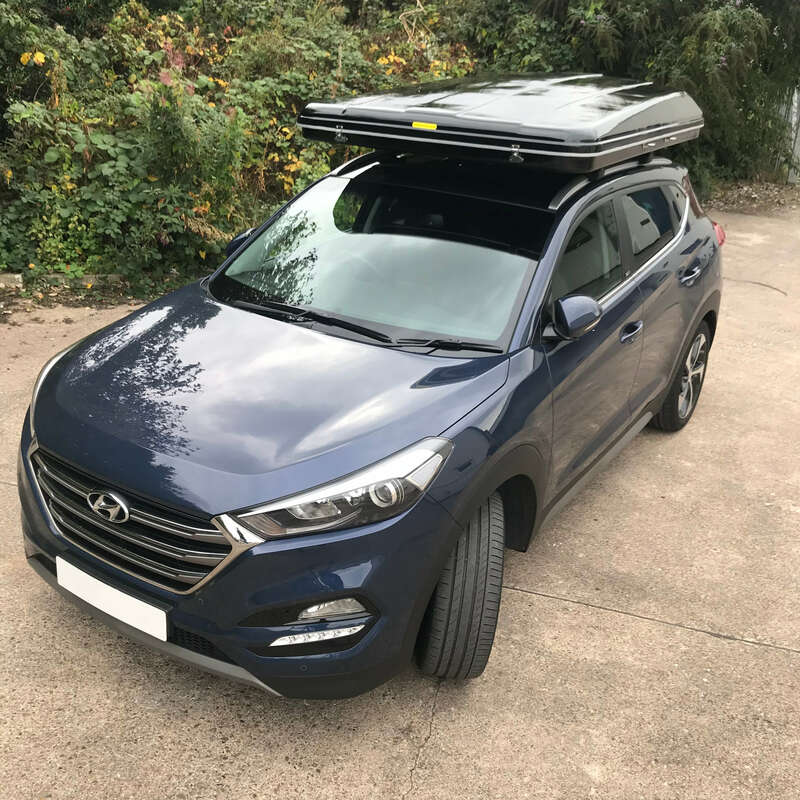 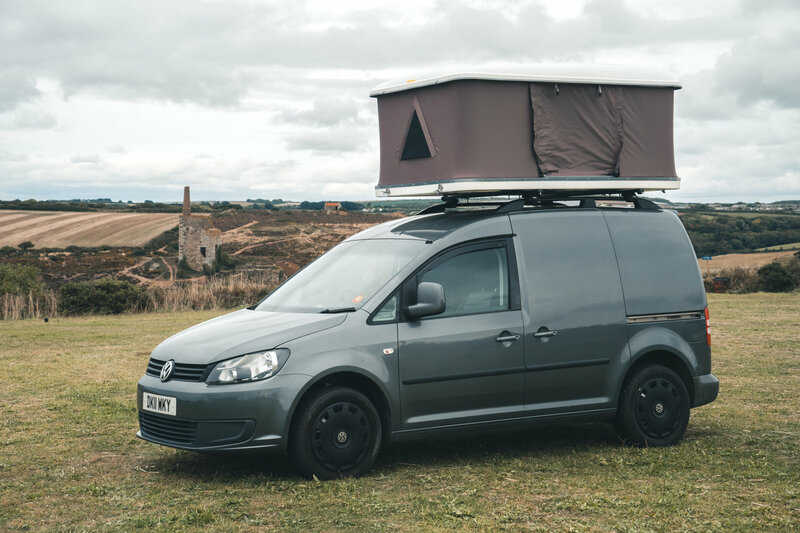 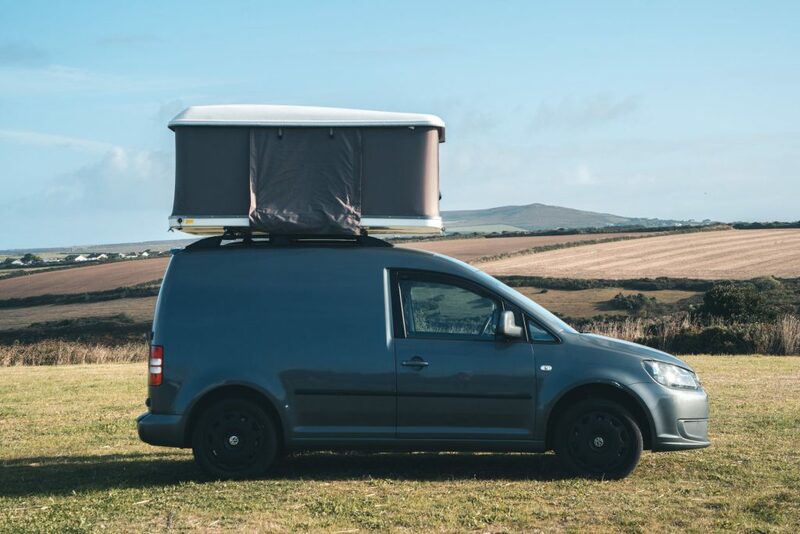 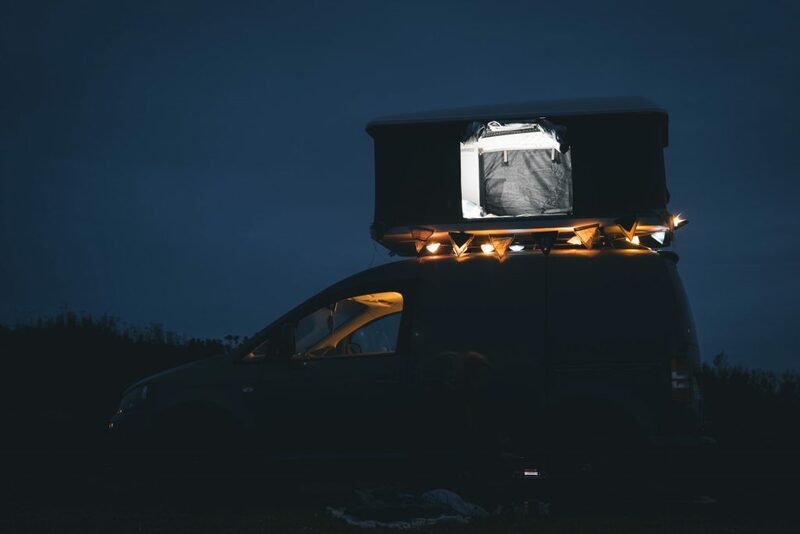 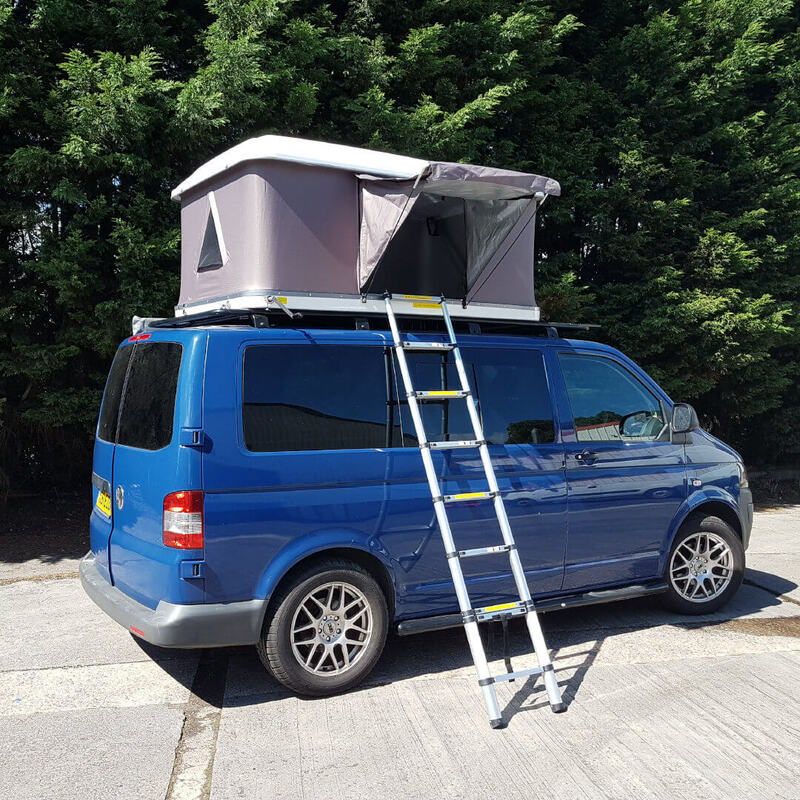 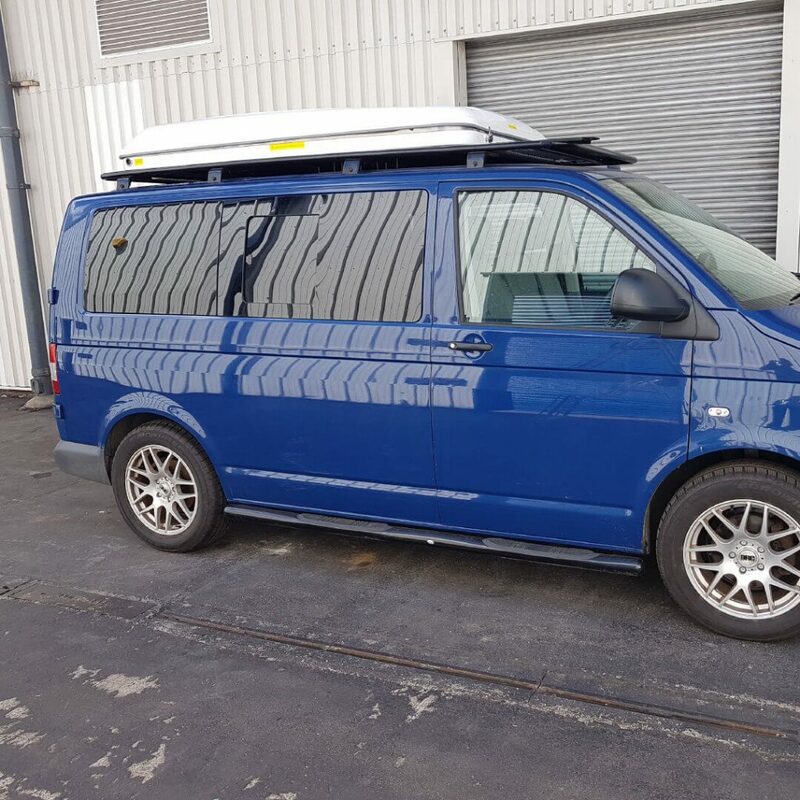 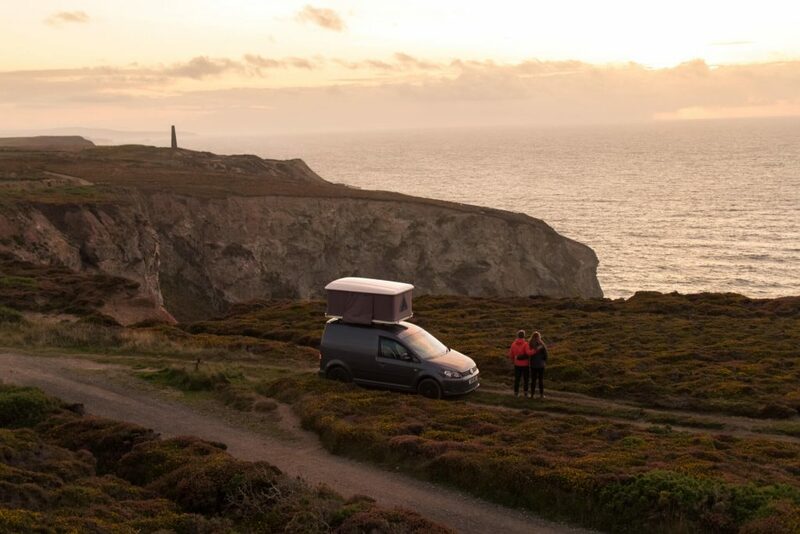 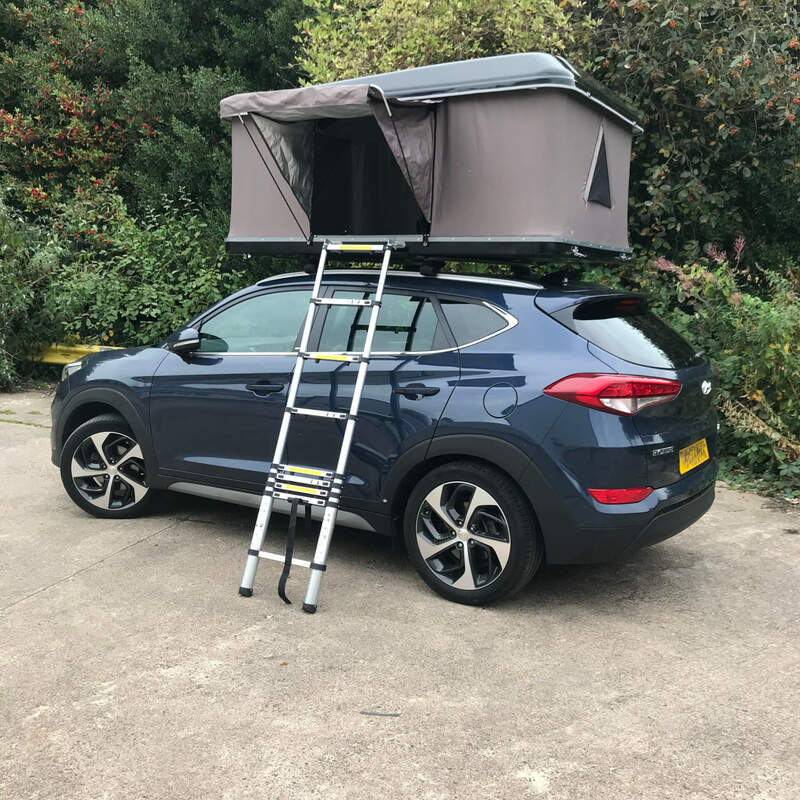 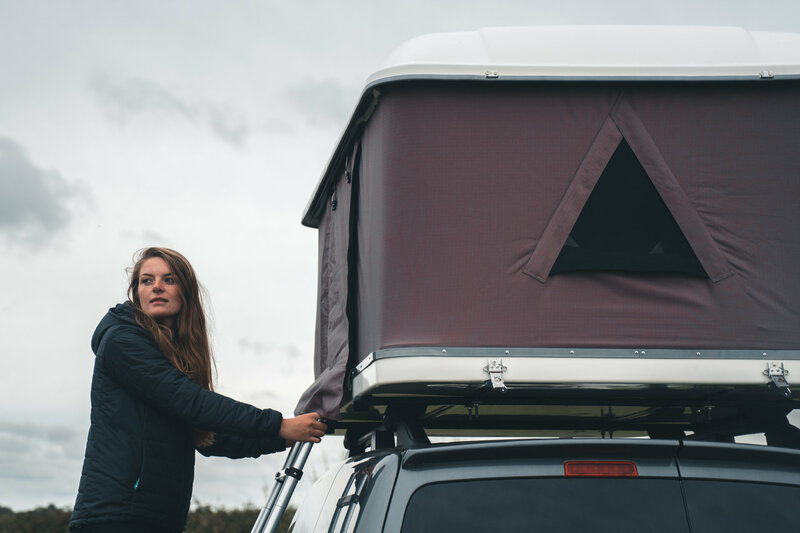 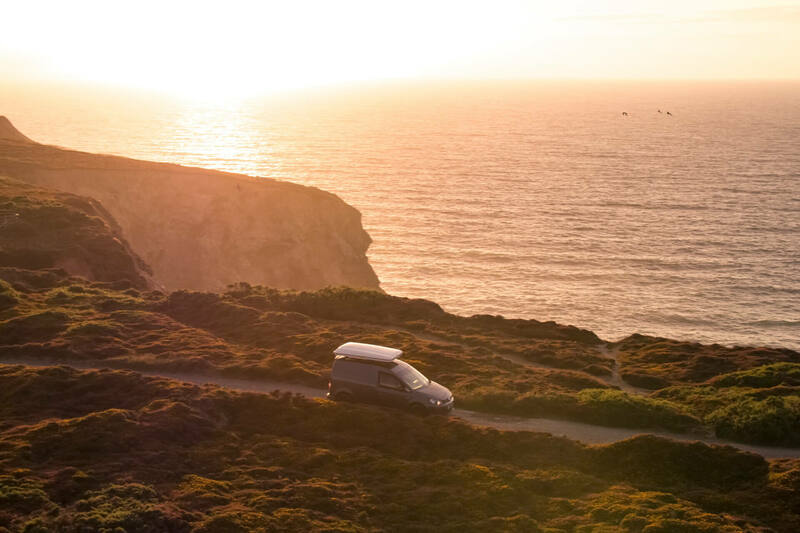 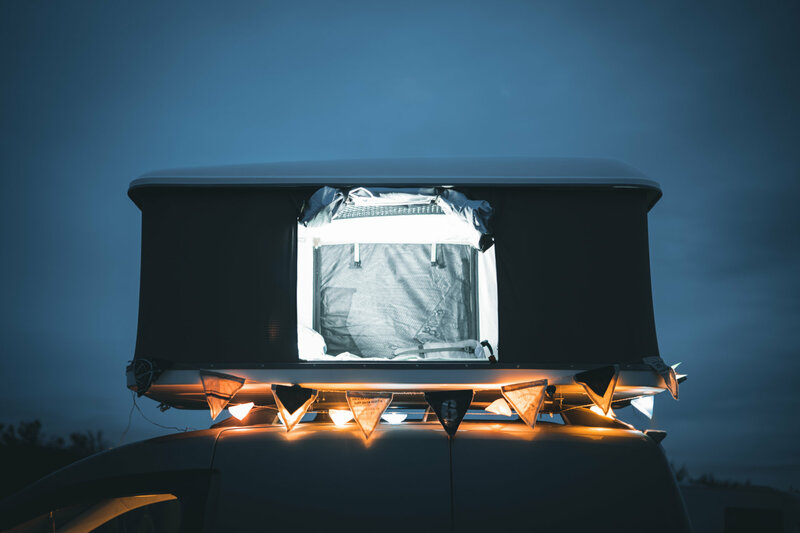 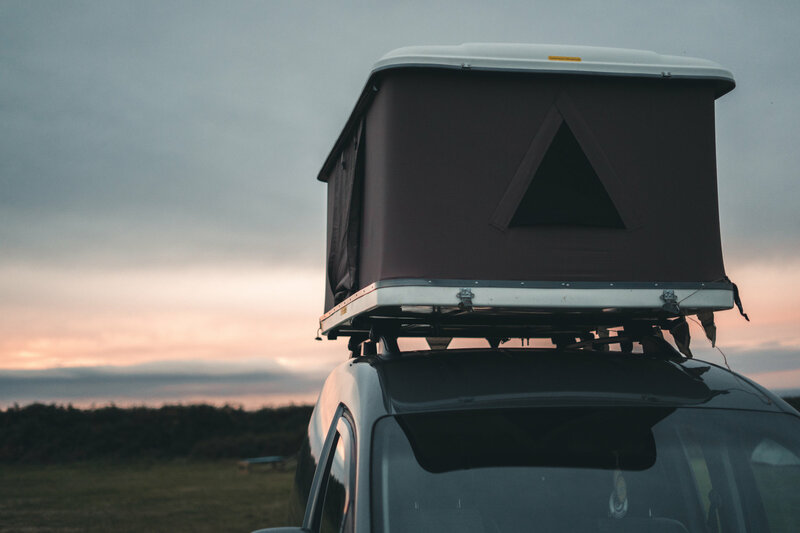 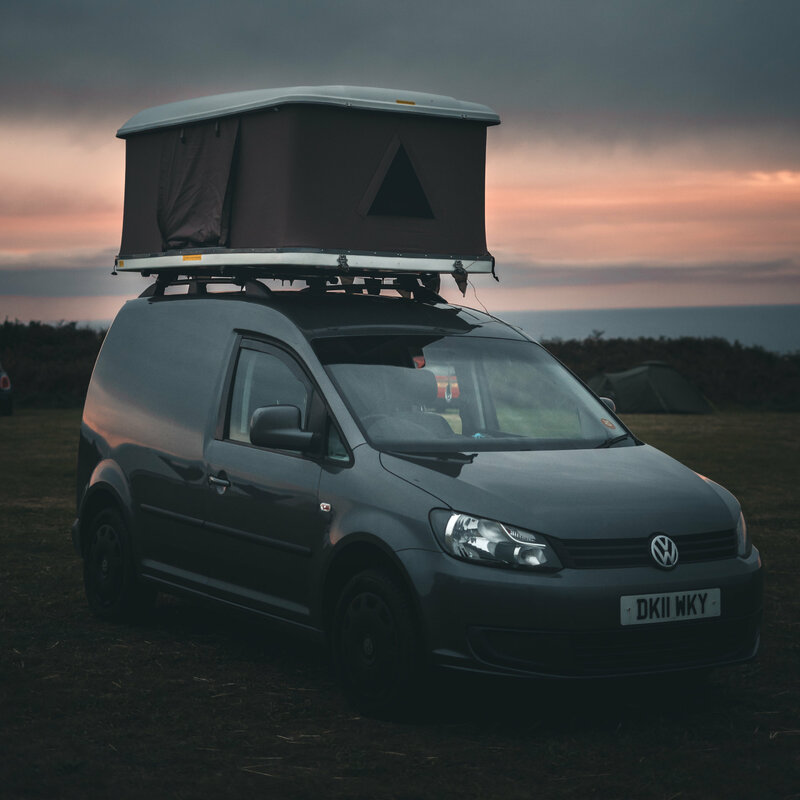 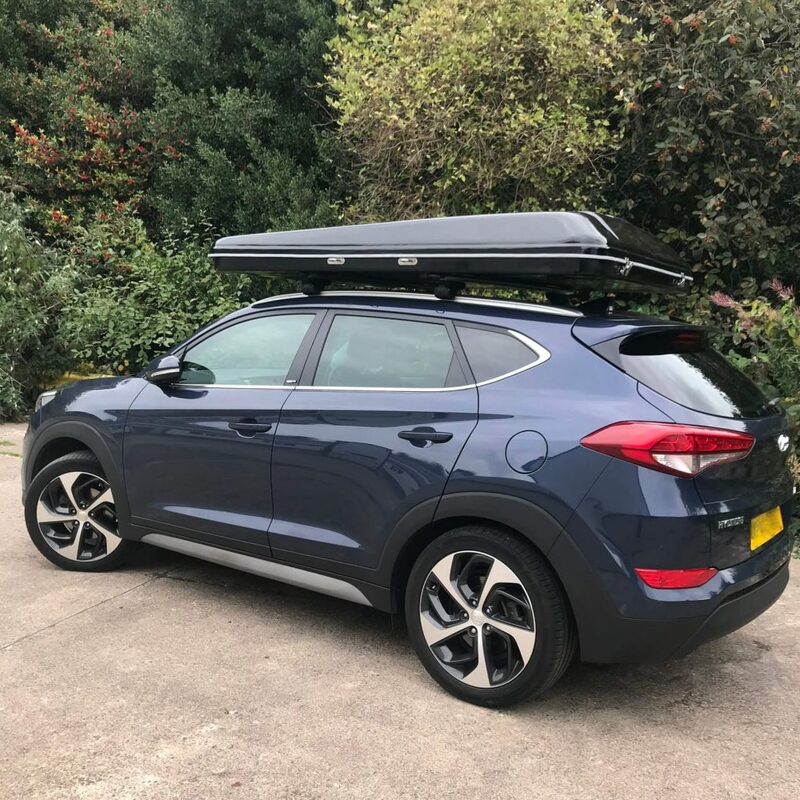 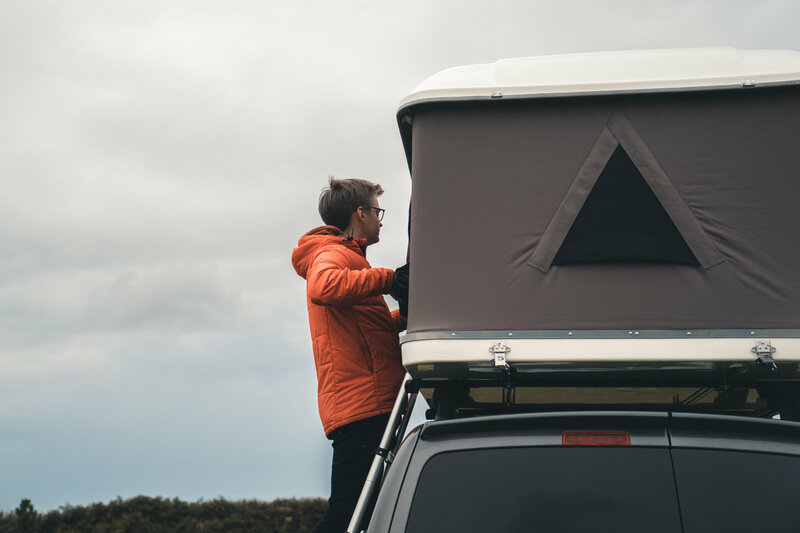 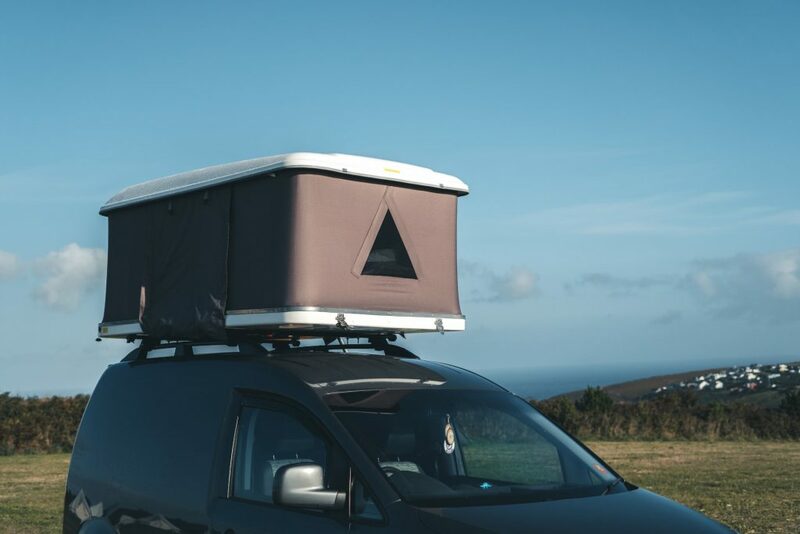 Sleek aerodynamic fibreglass roof box outer shell to reduce airflow when travelling and keep the whole tent light, safe and compact. 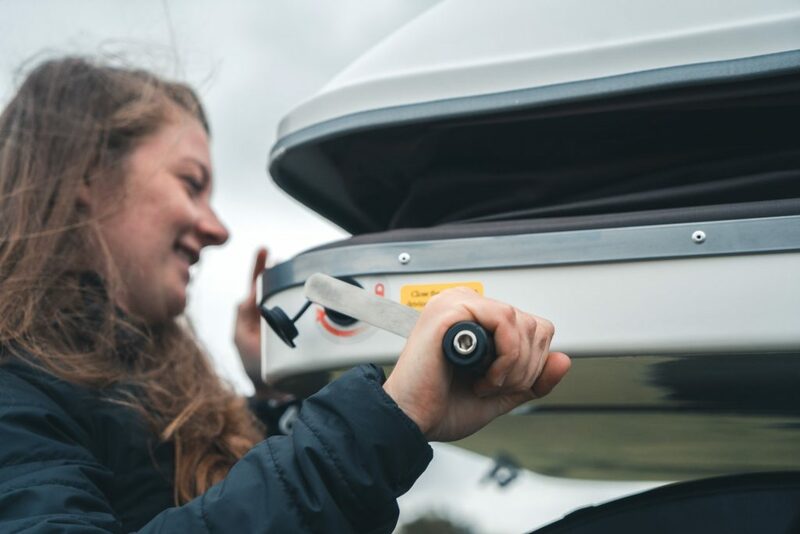 Simple to use hand crank mechanism means that one person can get the whole tent setup up in a couple of minutes! 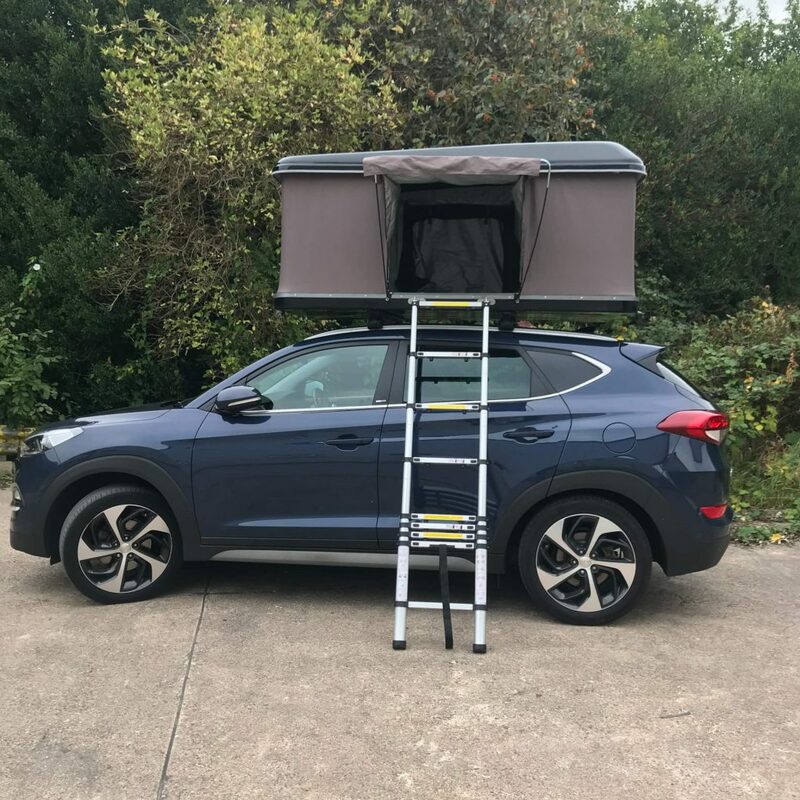 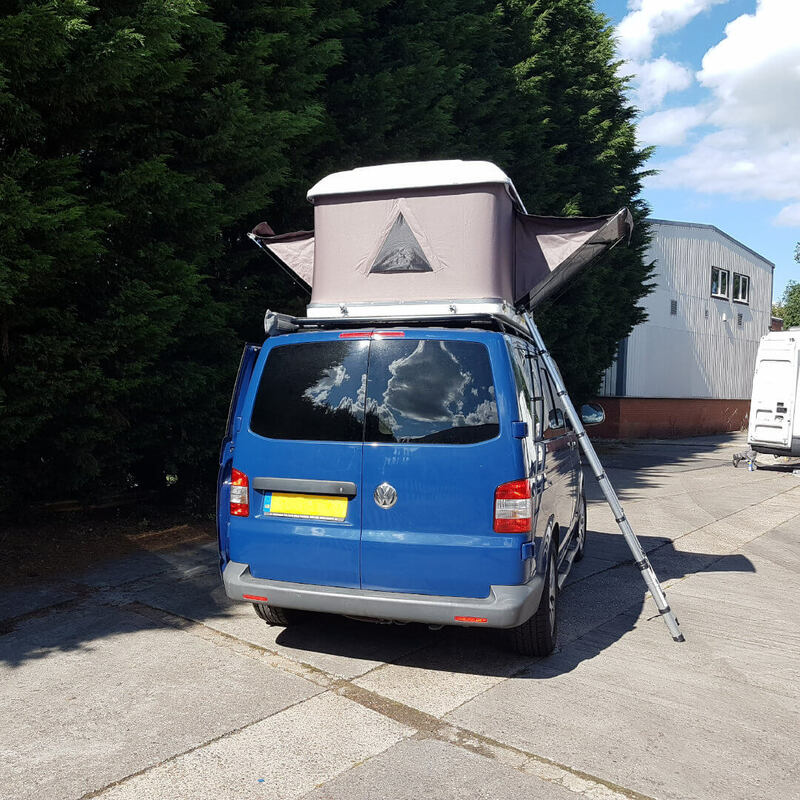 Aluminium telescopic ladder and universal brackets mean that the tent can be used on many different vehicles of varying heights. 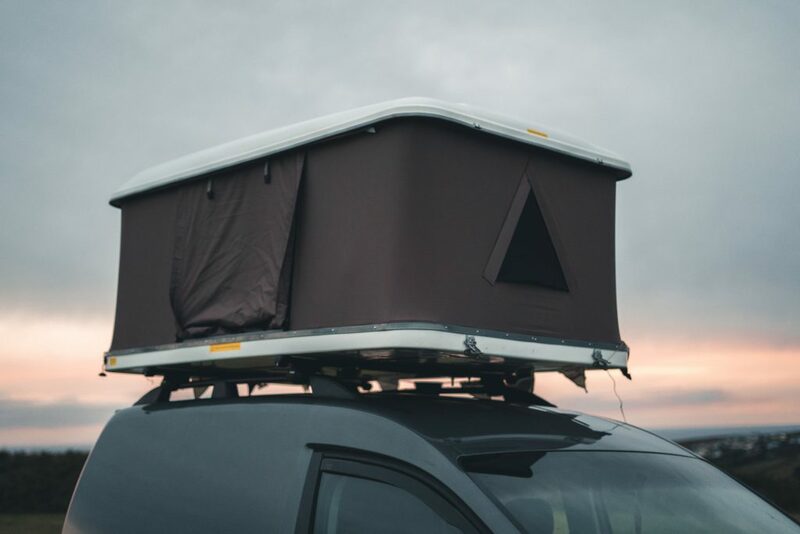 > Fits universally to almost any vehicle with roof bars or roof racks. 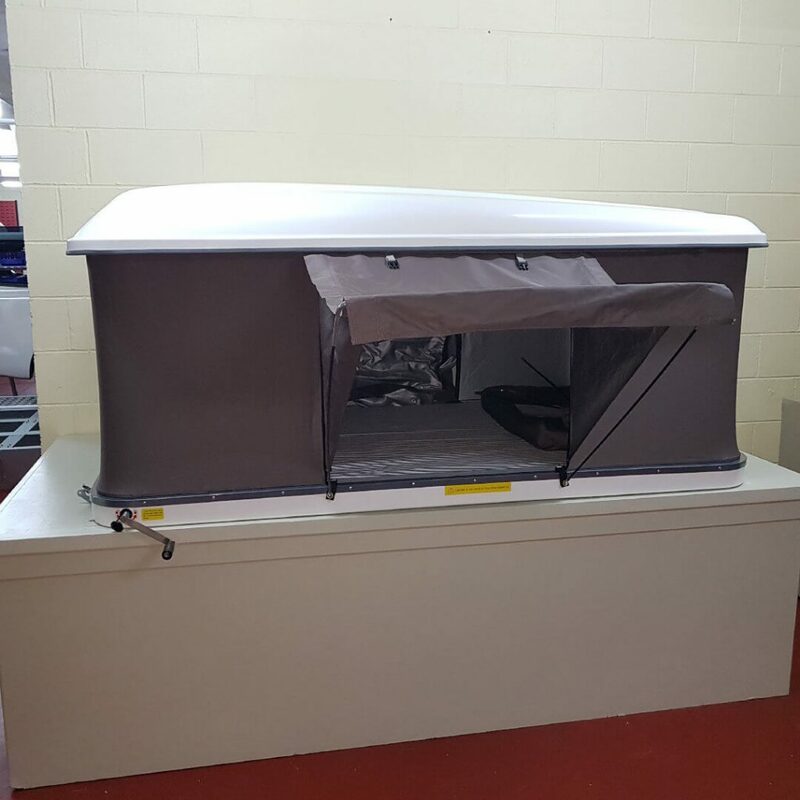 > Heavy duty aerodynamic fibreglass outer shell in a clean and stylish gloss white finish. 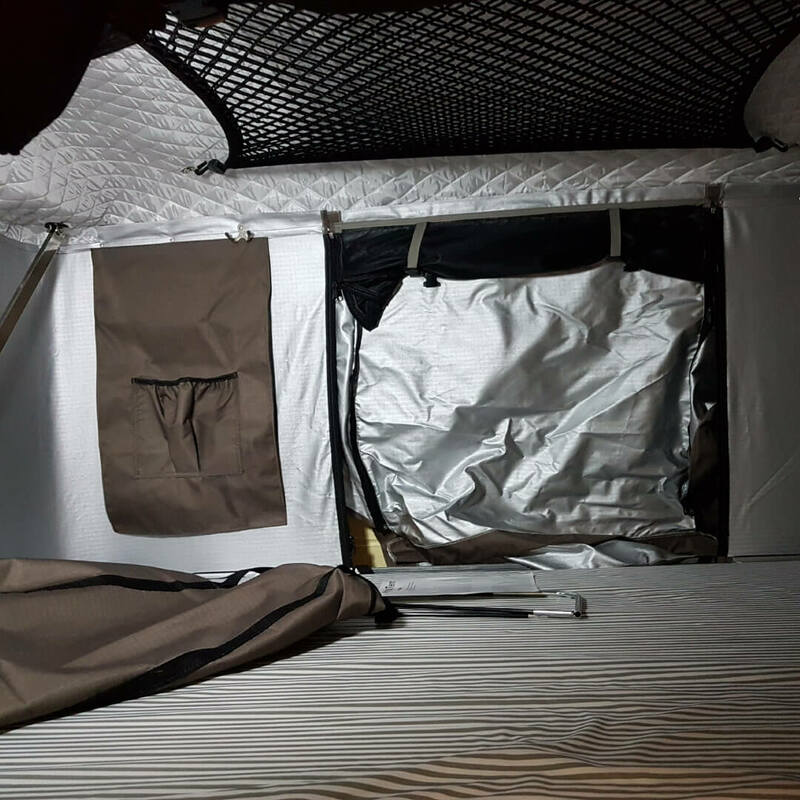 > 600D PU coated and waterproof polyester material in a rugged coffee brown finish. 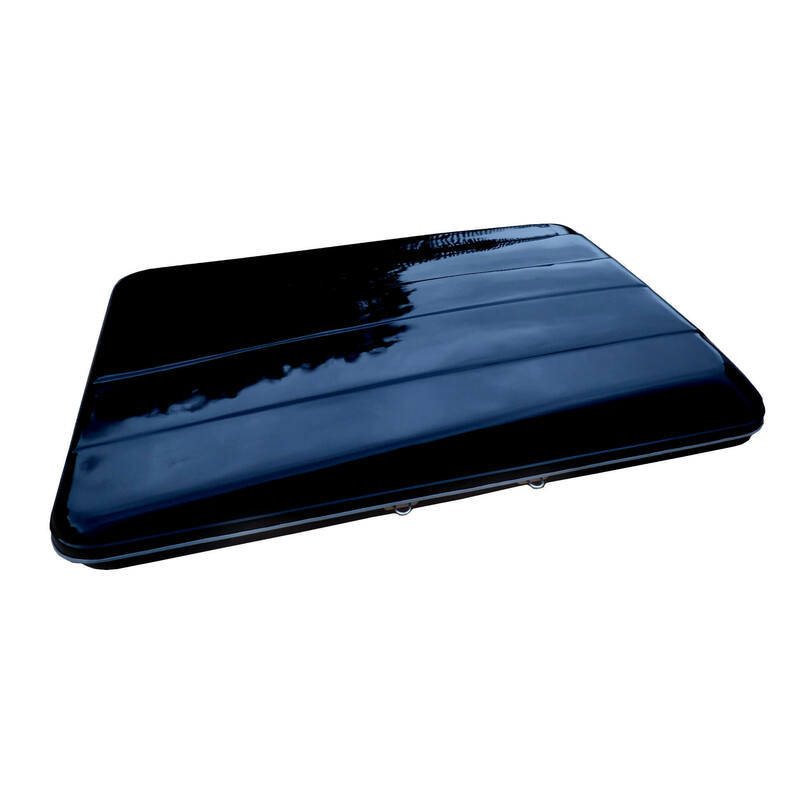 > The thick and comfortable built-in mattress ensures you get a good night's sleep and comes with a washable cover. 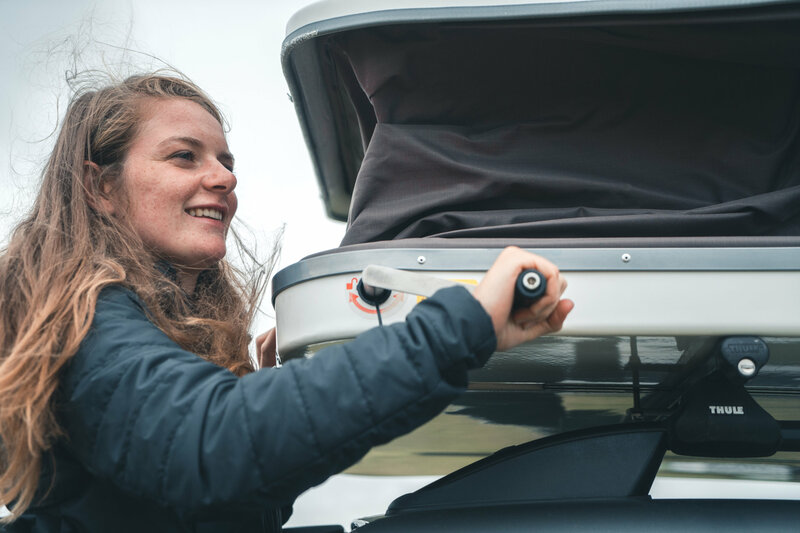 > Simple, smooth, removable hand crank mechanism makes erecting your tent quick and easy. 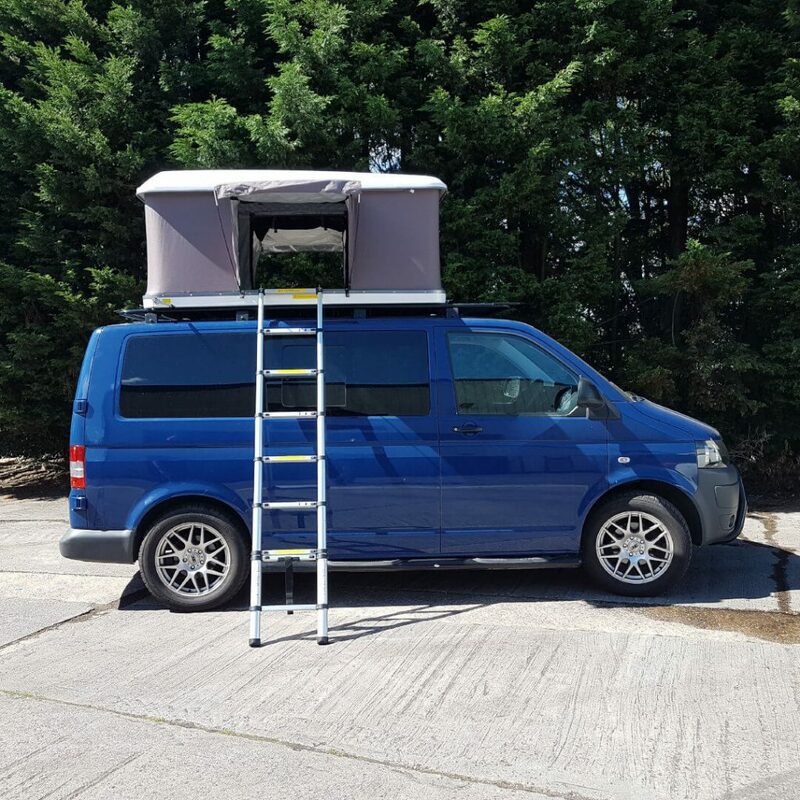 > Includes strong telescopic aluminium ladder with carry bag for ease of access. 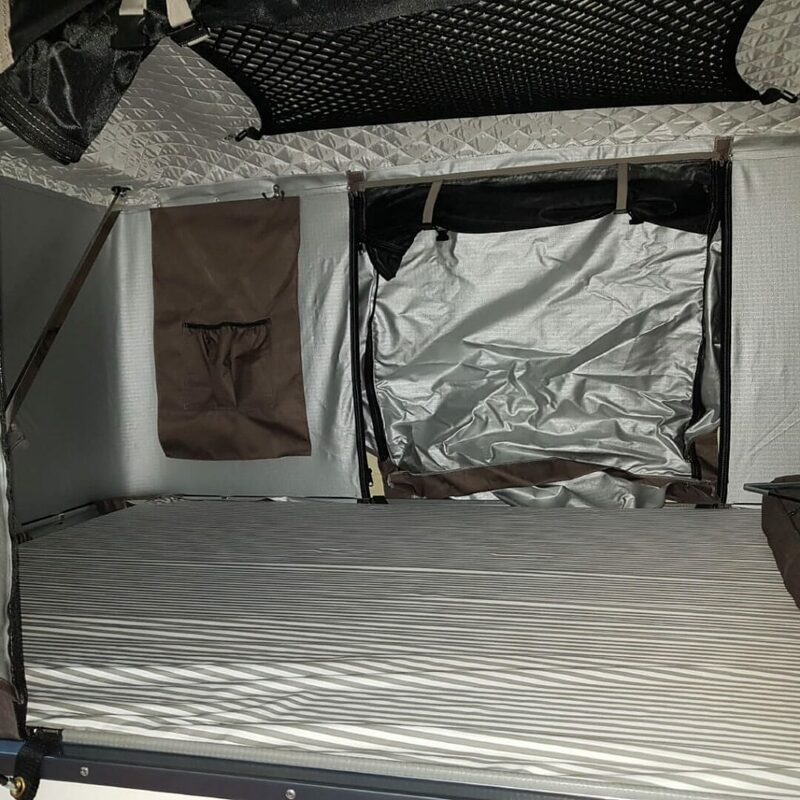 > Soft, reflective interior designed to improve insulation, comfort, light reflection and noise dampening. 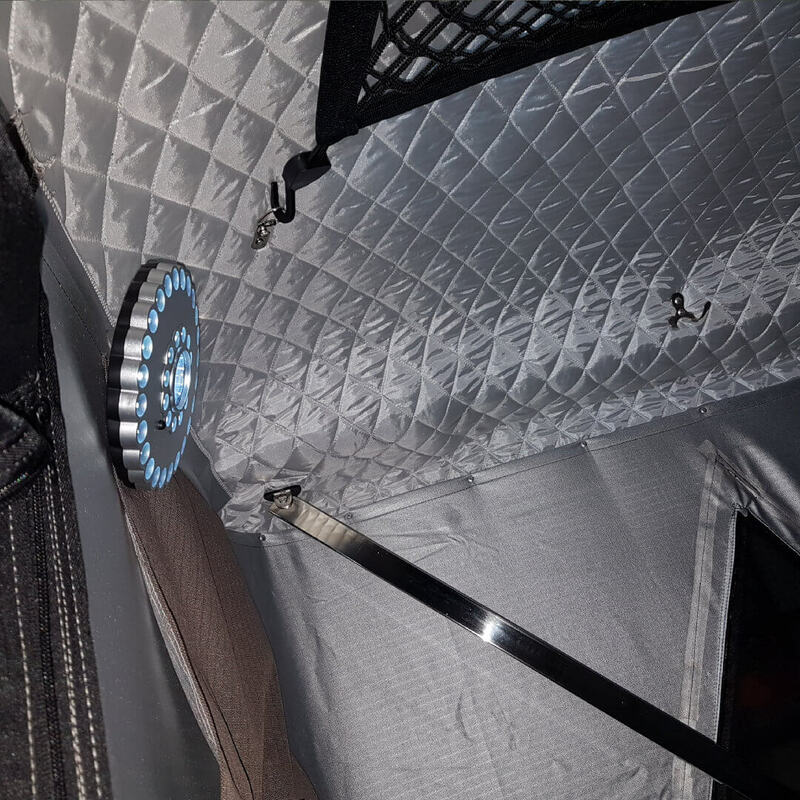 > Internal bright LED light for night time reading. 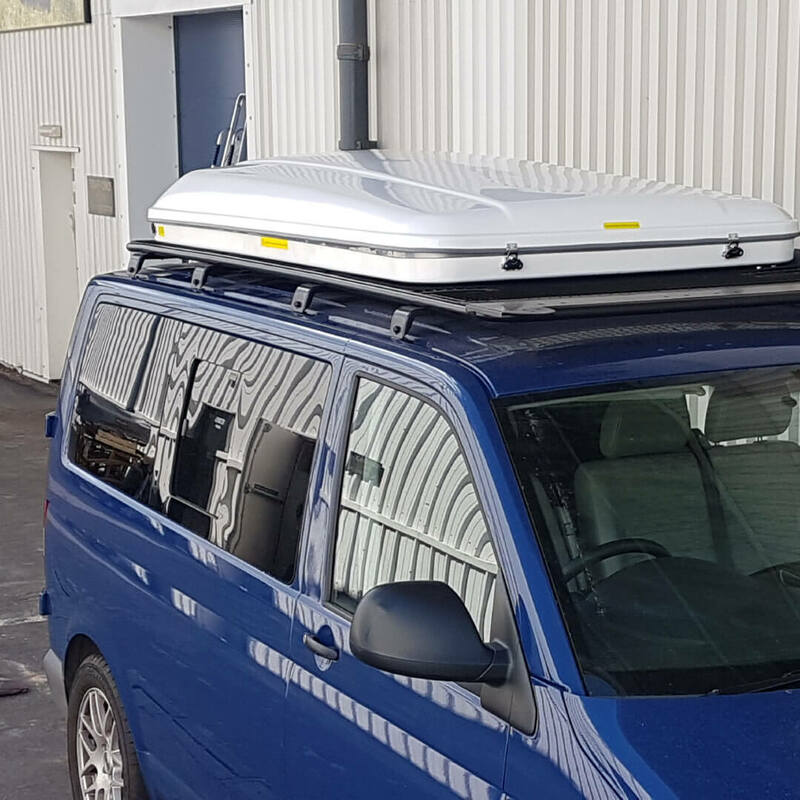 > 2 multilayer privacy side windows for observation and ventilation. 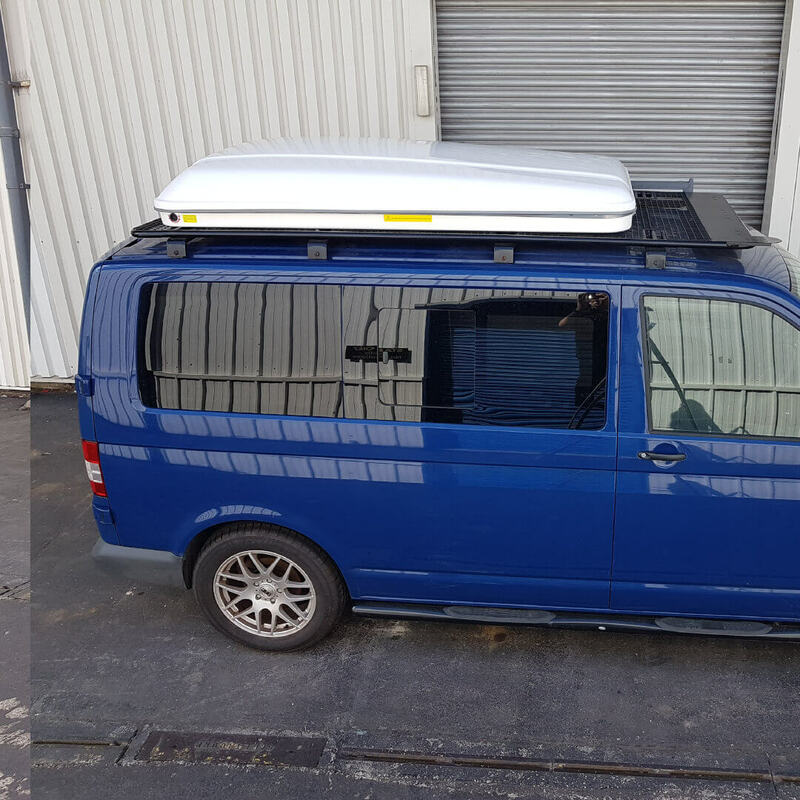 > Front and rear doors with weatherproof canopies. 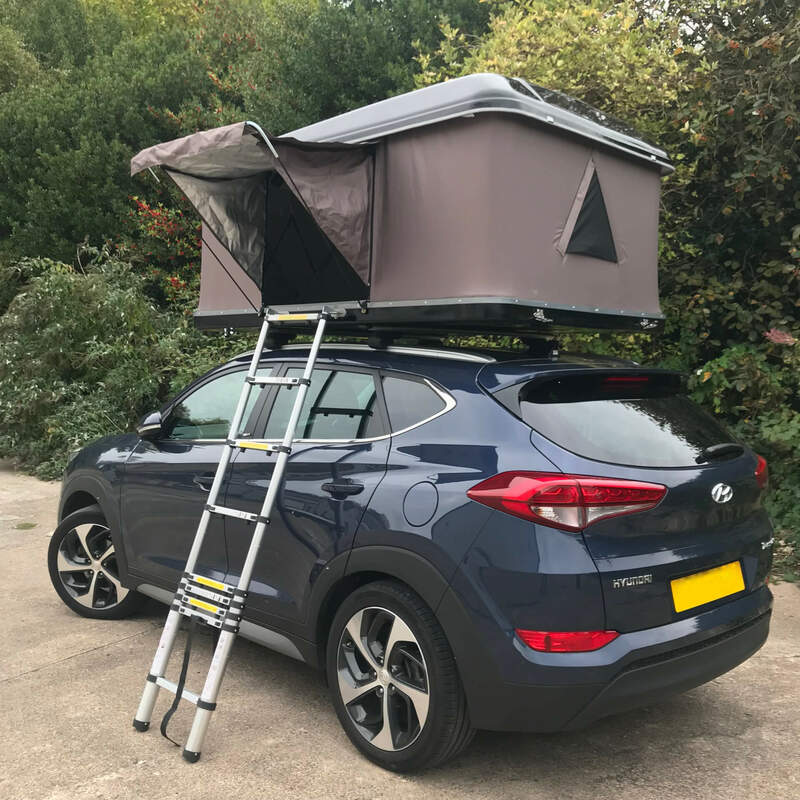 > Comes with all the necessary fixings and tools. 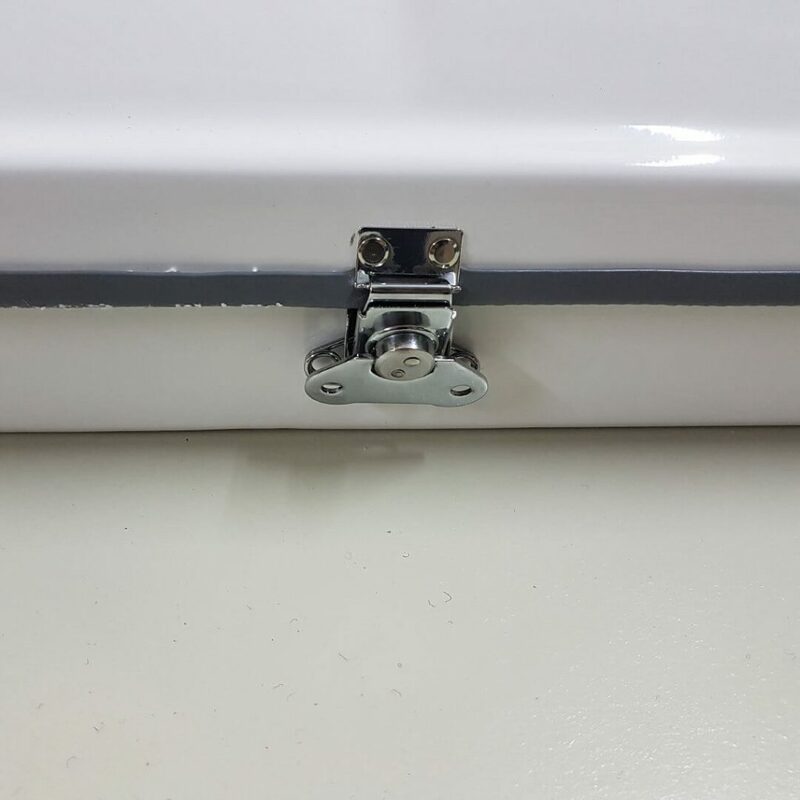 > Easy to fit, maintain and set-up. 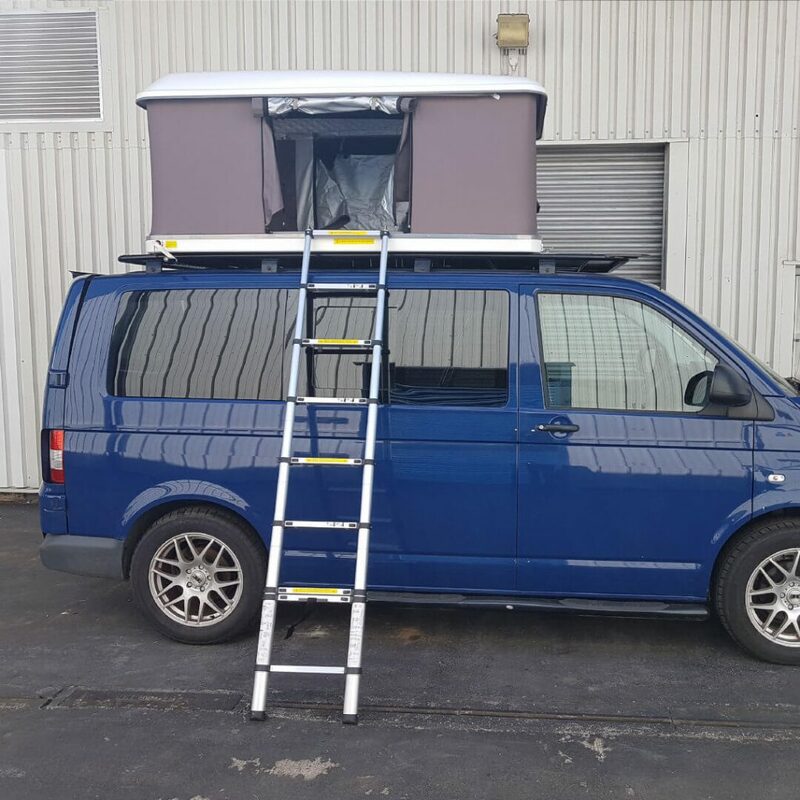 Assembles in just a couple of minutes! 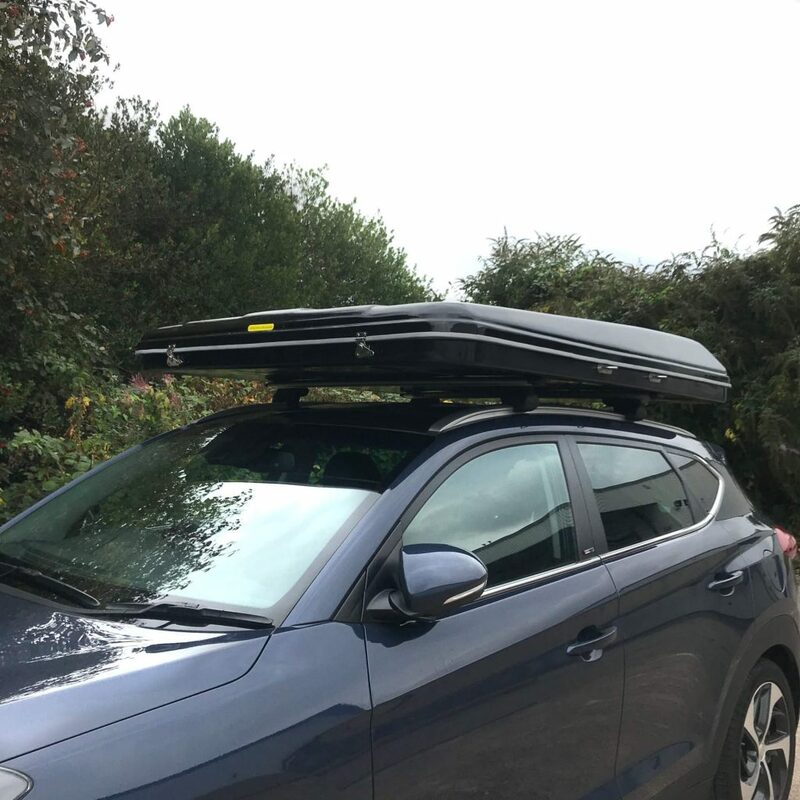 > Fitting for this item (not including any roof bar or roof rack installations) is £110 inc. VAT. > Click here for more information on our fitting service and prices. 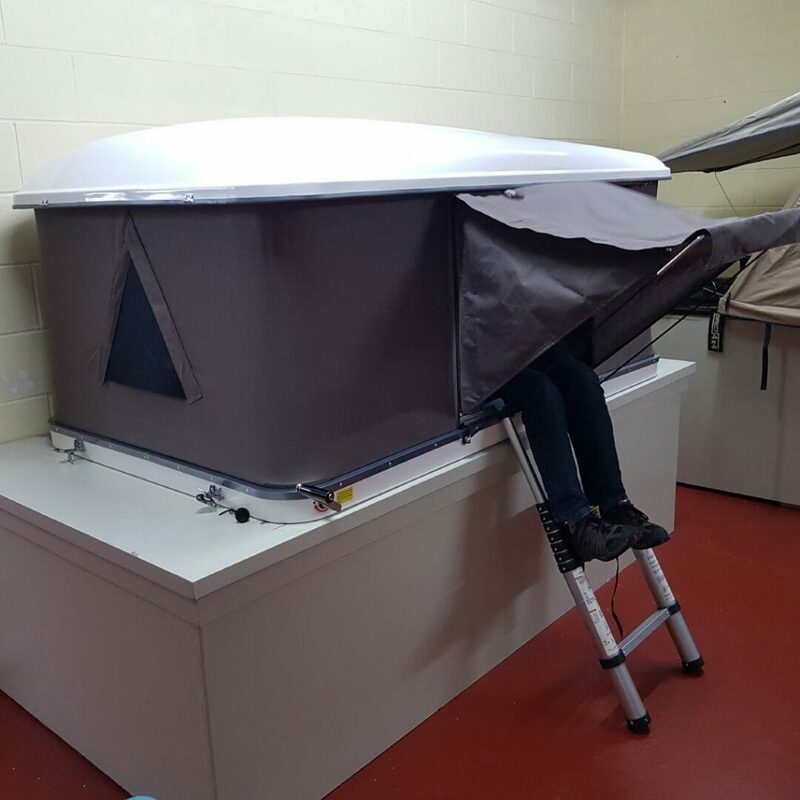 > Self-fitting and set up instructions can be found here. > Kit includes 65mm and 90mm bracket sets. 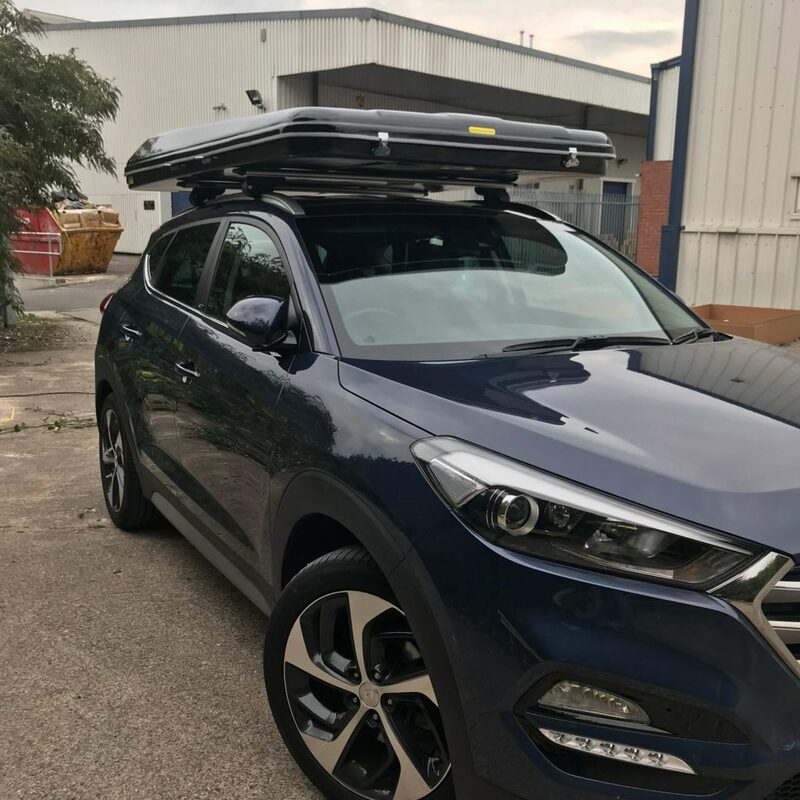 > Recommend 3 or more roof bars to ensure security and stability. 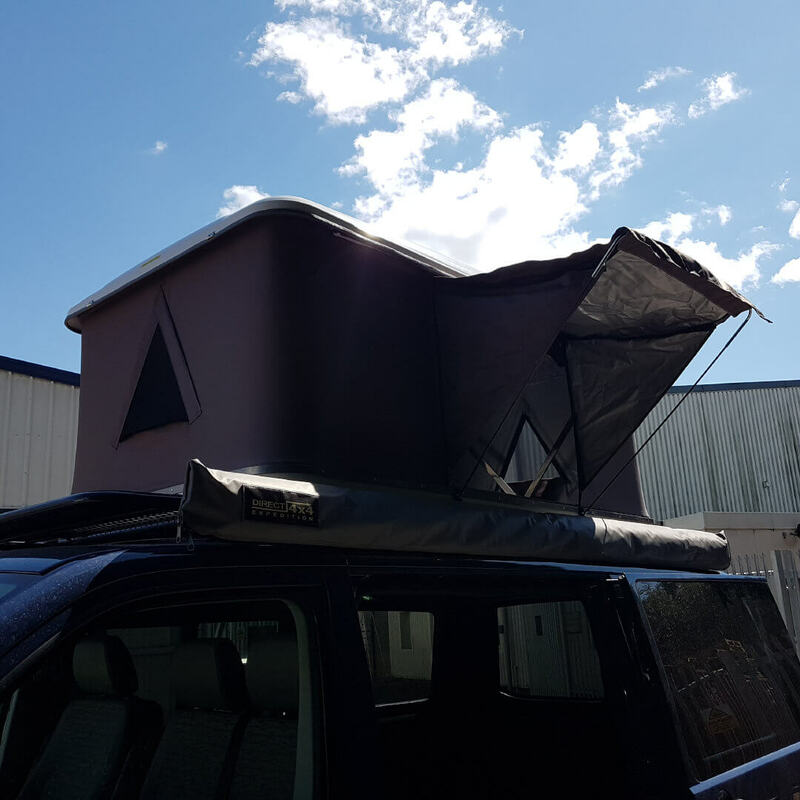 > Roof bars should be a minimum of 1.2m apart. > Will require 2 people to lift onto the roof and fix securely. 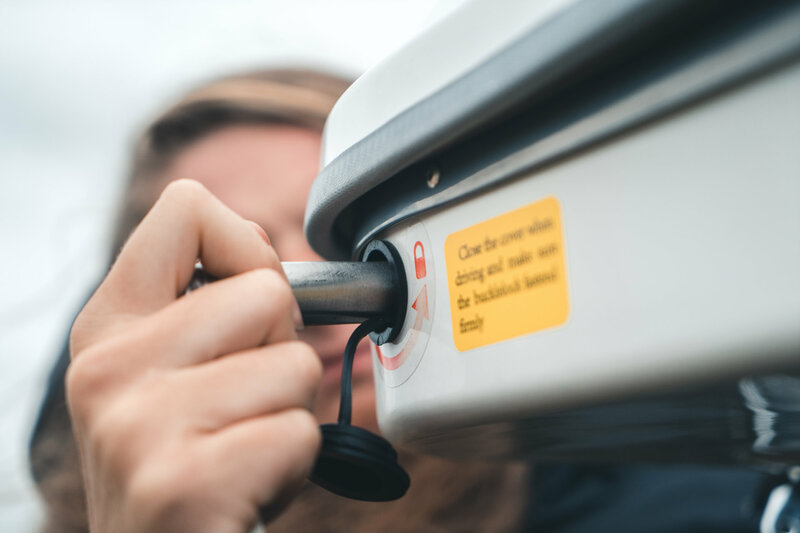 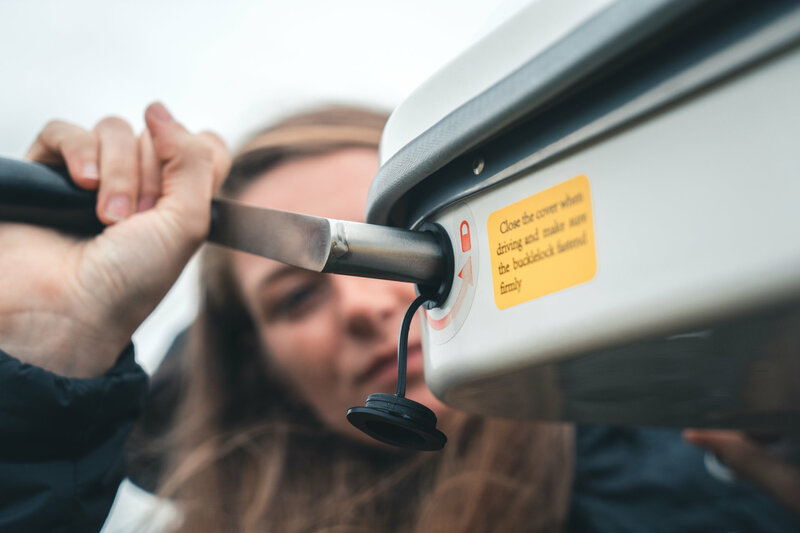 > Please check all brackets and locking clips before each journey to ensure the tent does not move during transit. 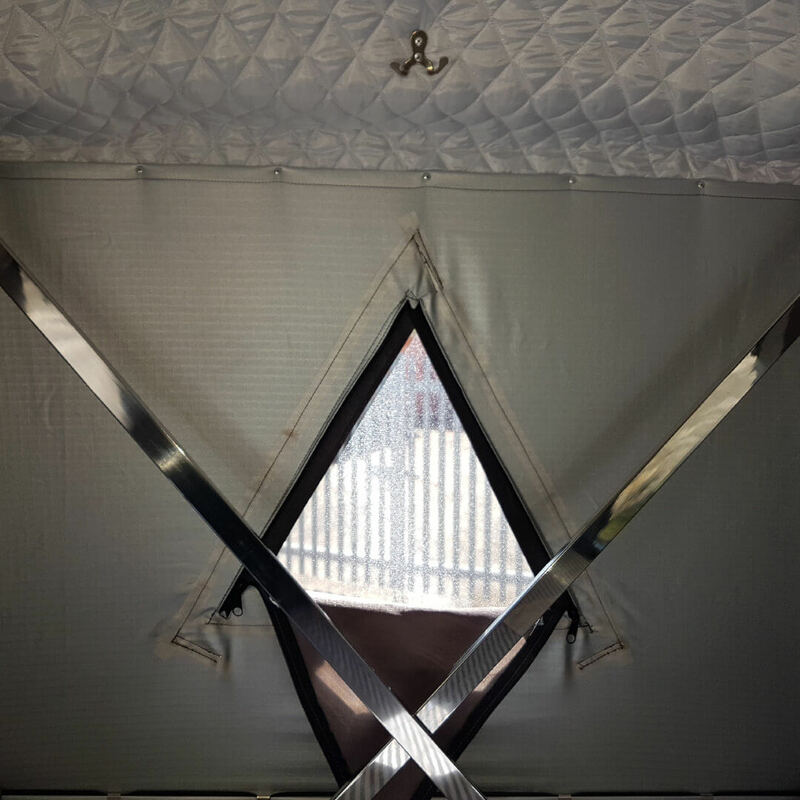 > Dimensions when closed: Length=215cm (84.65 inches), Width=125cm (49.21 inches), Height=30cm (11.81 inches). 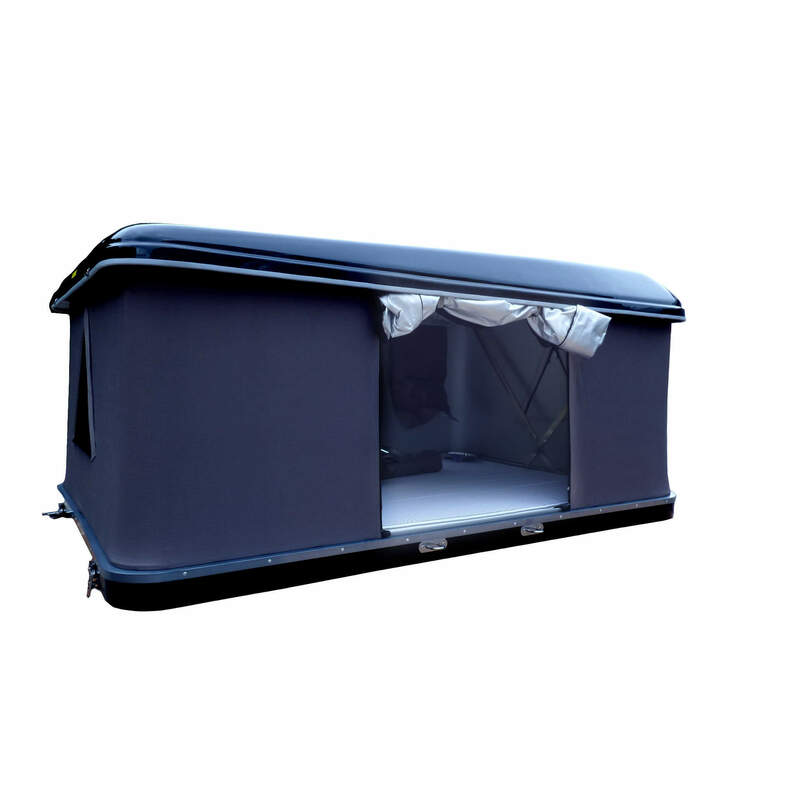 > Dimensions when open: Length=215cm (84.65 inches), Width=125cm (49.21 inches), Height=100cm (39.37 inches). 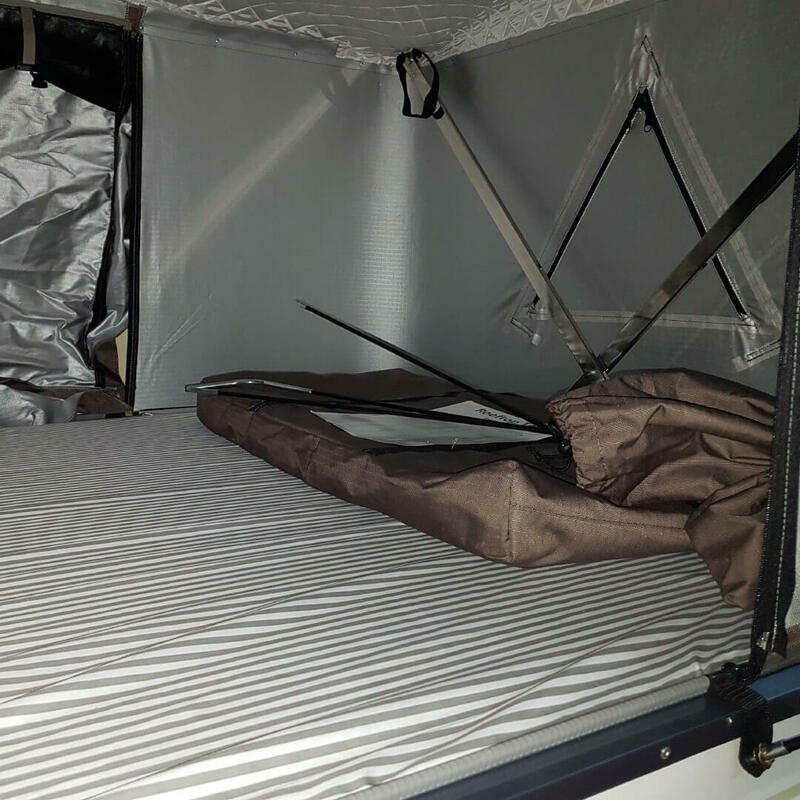 > Mattress size: Length=185cm (72.83 inches), Width=115cm (47.28 inches), Depth=7cm (2.76 inches). 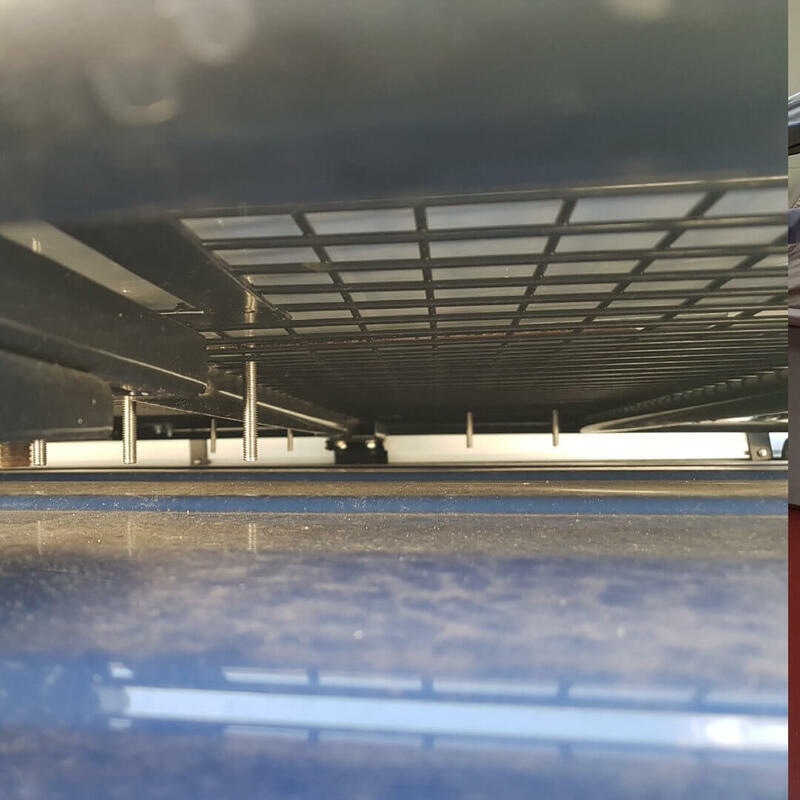 > Maximum ladder extension is 210cm (82.68 inches). 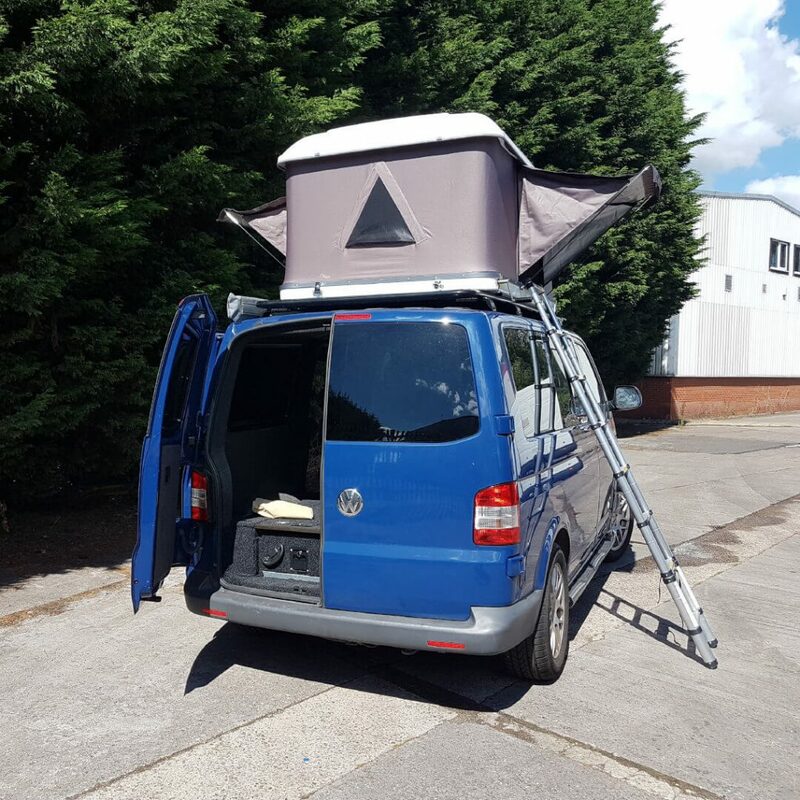 If you have any questions about this amazing piece of kit, just contact our sales team or visit our showroom and have a go yourself!